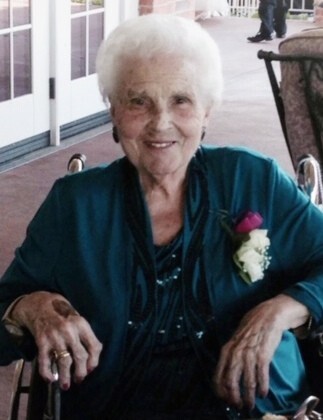 Claire Bisesti Bottone, devoted mother, grandmother, and great-grandmother, of Manahawkin, NJ passed away Tuesday April 2 surrounded by her loving family at the age of 100. Born in Liveri, Italy in 1918, she immigrated to the United States with her family in 1927. A long-time resident of Brooklyn, NY, Claire worked for many years as the bridal consultant at Kleinfeld, an upscale bridal salon, from which she retired. Pre-deceased by her husband of 46 years, Anthony Bottone, her great-grandson Matthew Grisaffi, her son-in-law Robert Shagon, and her sister Teresa Palumbo, Claire is survived by her three daughters JoAnn Bottone of Manahawkin, NJ, Carole Shagon of East Windsor, NJ, and AnnaMarie Monteforte of Brooklyn, NY, as well as her nine grandchildren and 12 great-grandchildren and many nieces and nephews. Visitation for family and friends will be Friday, April 5 from 2 to 5PM and 7 to 9 PM at the Barnegat Funeral Home, 841 West Bay Ave., Barnegat, NJ (609) 660-8292. The Funeral Mass will be held Saturday, April 6 at 9:30 AM at St. Anselm Roman Catholic Church 82nd St and 4th Ave., Brooklyn, NY. The burial will be held at St. John’s Cemetery in Queens, NY following the church service. In lieu of flowers, donations may be made in Mrs. Bottone’s name to St. Jude Children’s Research Hospital (www.stjude.org).